This is the first article of the “Essential tools for debugging and troubleshooting” series. Visit the series main page for more information and to discover other tools. Dependency walker (a.k.a Depends) is a simple yet powerful tool that you’ll find invaluable if you have to track the native dependencies of your components (EXE or DLL). Dependency Walker can be used for static (without having to run any code) or dynamic analysis (with dependencies tracked while running your code). I’ll illustrate its usefulness with a from scratch sample. Say you are in the very common situation where you have a native dependency which itself has dependencies. When the “native2” dependency is missing, often the root cause remains hidden and you get a generic error message like “Unable to load DLL ‘native1.dll’ : The specified module could not be found” without mentioning “native2”. So you first naively double-check that your “native1.dll” dependency is here and accessible but once you’re convinced “native1.dll” is not the root-cause you realize you definitely need more information to troubleshoot the issue. Let’s reproduce this situation with a very basic sample and troubleshoot it with Dependency Walker (source code is packaged here : Depends sample source code). So the Test application calls the f function of native1 and f calls itself the g function of native2. So let’s build our amazing application that does nothing! We now have a “native2.dll” DLL and a “native2.lib” exports file. Nothing, no errors, the boss will be happy. Now let’s play and imagine that the application has been deployed on another environment where native2.dll is missing or is not where it is expected. Oops! we’ve broken something, let’s see what Depends have to say about it. Run the “depends.exe” application you’ve downloaded from the Dependency Walker website. So at this point Depends is only telling you something you already knew. 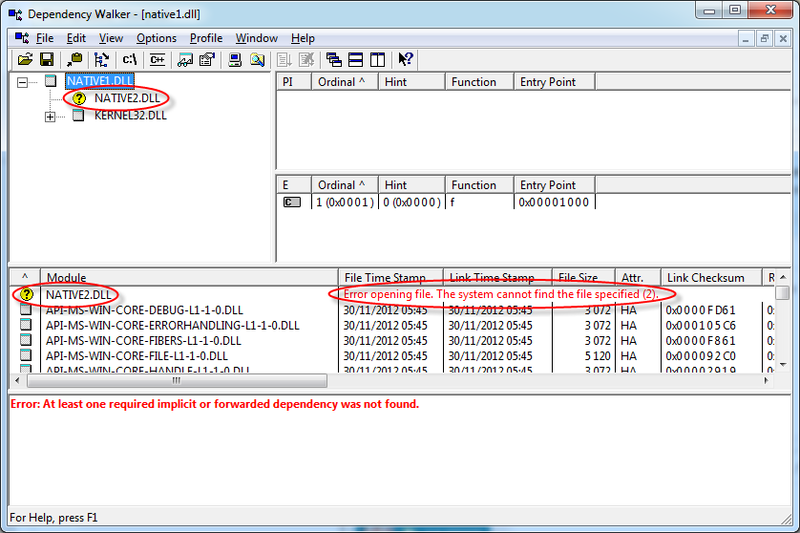 Interesting : we now see the root cause : the “native2.dll” file is missing. From here you can check if the “native2.dll” is on the system; if no install it, if yes check that its folder is correctly referenced in the PATH environment variable. I hope this quick introduction and demo of Depends have been helpful to you and that you will leverage Depends in your future troubleshooting sessions. Actually Depends can do more than dependency tracking: for instance in the screenshot you may have noticed that Depends also displays the list of all the exported functions of the DLL (here only “f“) which can at times be a very useful information when you don’t understand why you are not able to access (e.g. via DllImport) a function that should be available. If you have any remarks, questions, suggestions about this article or want to share your experience using Depends please let a comment. This entry was posted in .Net Development, CodeProject, Development and tagged debug, procmon, remote debug, Visual Studio by pragmateek. Bookmark the permalink. Could you please send me the URL of your blog first?